First of all, I listened to the audio edition of this book. On Goodreads, the audio edition does not give credit to the author, just the editor. I felt this was a disservice to the author, so I am using an edition that clearly states the author. The book is a compilation of thoughts, quotes of Native Americans taken from historical documents. Not really for entertainment, more for meditation and reflection. I have great respect for the author and his work. I was moved to tears more than once in listening to the simple but so profound thoughts. The audio edition is very well done with various speakers male and female. And yes, the editor did a fine job. I will be listening again and again. As in the case of the holocaust and any dire historical event, we need to remember and work to be better. This took only a couple of hours to read and it was time well spent.This really isn't a book for entertainment and is more of a philosophical read about Native American spiritualism. But I really can't say that, either because it's a compilation of quotes and brief readings by Indians of yesteryear and even today. It's fascinating and it really has a lot to say and the time it takes to read it just flies by. The topics range from giving birth in one chapter, to living, to dying, religion and Christianity, and how messed up the white man's way of thinking is.It is not a hate book. It just points out differences in thinking.I guess I must have been a full-blooded Indian in a former life instead of just the part-Indian I am now because I agreed with everything this book said and I've been practicing it for a long time. Long before I got this book. I'm also teaching my children to walk the Red Road but they aren't like the Indian kids of the past. That's for sure. I was raised as a white person as was my entire family. It came out a few years ago that we have a great-grandmother that was a full-blooded Cree.There are two books that my kids have to read after they get to certain age. One is Tuesdays with Morrie and the second one is Native American Wisdom. There's a lot to be learned from both books and you don't have to be Indian to appreciate the latter. 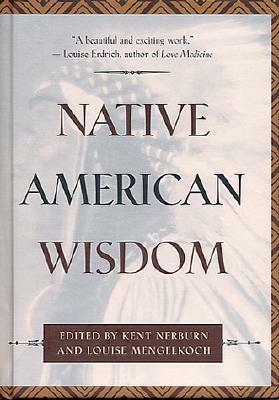 This just a little book, but it is chock full of quotes and insight from famous Native Americans. It will give you an entirely different insight about the Native American Experience. A collection of thought from of the original Americans. Gives insight into another way, another perspective to look at life. Thought this book was sweet and sad. I liked how it's goal was to preserve the words of the oral tradition Indians, the Indians now of the past. Their words are still very valuable for today. Great insights into Native thoughts that make even more sense today. I read the book a while ago and then found the audio recording at the library. I enjoyed both versions, but listening to the tape as I drove across the midwest was a special experience. These are wonderful insights and thoughts to ponder and reflect on. I love being out in nature, so the perspective holds special meaning. I enjoyed the way the book was divided into different phases of life. It is a book I will go back to every so often as there is so much relevance and so many connections to our lives now. What anyone with half a brain has known all along. This book combines the power of long-term thinking with community responsibility and shows what true leadership really means. Deceptive in its simplicity. One easy read that is definitely worth it! This is a great compilation of observations of Native American Chiefs of the 18th and 19th Centuries with particularly pointed critiques of the foreign "Christian religion " foisted upon them. I like how this book was compiled, I just wish there were an introductory essay on the different tribes.